David Orme wins 2017 Member of the Year award. David Orme is our Member of the Year for 2017. He received his certificate from charity president Colin Boocock. 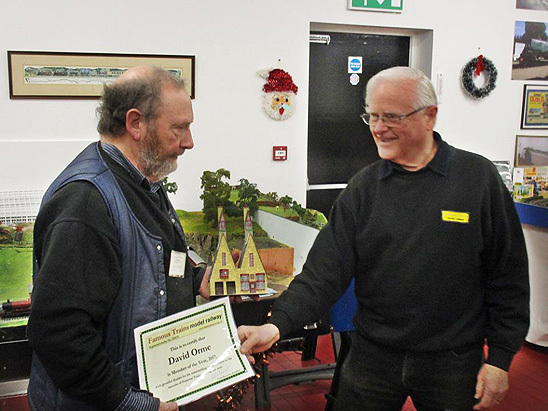 The certificate is awarded at the president's discretion to a member who has made an outstanding contribution to the progress of the Famous Trains model railway centre during the past twelve months. This year David has been concentrating on model buildings and other details for the big Chinley model railway and also for details for the Wart-Hoggs layout, seen in the background at today's presentation. The photograph above, taken by trustee Peter Swift, shows Colin Boocock (right) handing the certificate to David.